A current urban myth opines that it's not necessary for physician practices to employ coders because software can capture charges when the work has been completed. Or, since the physician performed the work, it's easier for him or her to assign the codes. In an ideal world, charges are captured and communicated to the billing system, and the codes appear automatically on the electronic claim submission. It would be an infallible system with no need for human intervention to ensure coding accuracy. But health care has not yet reached this level of complete and compliant billing. Once CPT coding guidelines, HCPCS Level II codes, payer policies, bundling issues, medical necessity, and constantly changing government regulations are taken into account, the situation becomes more complex. And as the level of complexity in coding increases, so does the risk of lost revenue and increased liability. With that in mind, here are several items to consider in the never-ending quest to ensure correct coding in the physician practice. The Office of Inspector General's (OIG) Model Compliance Program for Clinical Laboratories cautions that cheat sheets containing payable or covered diagnoses should not be used for the purpose of ensuring reimbursement by reporting only payable medical indications. While creating a job aid that includes common procedure and/or diagnosis codes used on a daily basis is not prohibited, it is essential to remember that this is only one tool used as part of a comprehensive coding compliance effort. There will always be situations where the service performed or the patient's medical condition is not included on the cheat sheet, necessitating access to authoritative coding resources. When budgeting for staff needs, consider including an allowance for a dedicated medical coder. The decision to hire an experienced coder or to train an existing staff member should be carefully weighed since both options require a financial investment. It may be desirable for coder candidates to be nationally certified, which typically requires a higher salary offer. According to the AAPC, the average salary for medical coders in 2017 was $52,648. This amount may vary based on job responsibilities and geographic location. • Ensure the correct assignment of evaluation and management (E/M) codes and provide immediate feedback on documentation issues. According to a May 2012 OIG report, "Coding Trends of Medicare Evaluation and Management Services," the average Medicare payment amount per patient visit increased 31% from $65 to $85 during the period from 2001 to 2010. The report adds that E/M services have been vulnerable to fraud and abuse. For example, in 2009 two health care entities paid more than $10 million to settle allegations that they fraudulently billed Medicare for E/M services. One of these organizations allegedly billed for higher levels of E/M services than were actually provided to patients. As a result, patient visits are an audit target and a focus of the OIG Work Plan for several years. Although the government's focus is on fraud, practices can actually lose annual revenue due to undercoding, often because staff or physicians are fearful that claims coded too high will be rejected or trigger a payer investigation. • Capture all services, detect potential for unbilled services, and track emerging reimbursement issues. 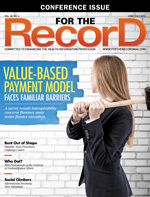 Payer policies are dynamic, making it essential that practices stay up to date on covered services, new codes for emerging techniques, and changes in reimbursement allowances—even slight tweaks to procedural or diagnostic codes can result in increased payment. The use of current codes also results in the presentation of a more accurate provider profile to local insurers. • Maintain the accuracy of diagnosis codes. Diagnosis codes are added, deleted, and/or updated every October 1. To handle these annual adjustments, dedicated coders ensure that diagnosis codes are updated on charge tickets or in computer systems. While prior versions of the diagnosis code set were not developed with reimbursement in mind, ICD-10-CM was designed for use in determining payment in a value-based care environment. In addition, diagnosis codes are necessary to report all patient conditions to demonstrate the complexity of care provided. Correct diagnosis code assignment also documents the medical necessity of the services performed. Often the key issue in determining whether a provider should be paid involves establishing a medically justifiable need for performing the service. Most claim denials are caused by poor documentation, which translates into incorrect diagnosis code assignment. For example, according to a recent survey by the OIG, 30% of all fee-for-service Medicare claims contained errors, with 37% of those errors due to a lack of documented medical necessity. • Ensure correct procedure codes are submitted. Any changes to CPT and HCPCS Level II procedure codes, which are updated throughout the year, are monitored by dedicated medical coders. The American Medical Association updates Category III CPT procedure codes twice a year (during the annual update of the CPT Manual and on July 1). In addition, the Centers for Medicare & Medicaid Services occasionally renders quarterly updates of HCPCS Level II procedure codes across all medical specialties. • Guarantee correct modifier application. Omission or incorrect use of procedure code modifiers can result in lost revenue. While modifier 59 (or the replacement modifiers XE, XS, XP, XU) requires close monitoring to ensure it is not overused, there are other modifiers, including 76 (repeat service) and 58 (staged procedure), that may require manual application in certain situations. A dedicated coder can ensure that claims requiring modifiers are submitted correctly the first time, eliminating the need to refile or appeal denials. • Ensure dictation templates are up to date and review documentation forms. It is essential to have clear, complete, and concise medical records, including proper documentation of the quality of care provided to the patient. Appropriate documentation is also essential to obtain timely and correct reimbursement for services provided. According to the OIG model compliance program for physician practices, "In addition to the standards and procedures themselves, it is advisable that bills and medical records be reviewed for compliance with applicable coding, billing, and documentation requirements. … Timely, accurate, and complete documentation is important to clinical patient care. This same documentation serves as a second function when a bill is submitted for payment, namely, as verification that the bill is accurate as submitted. Therefore, one of the most important physician practice compliance issues is the appropriate documentation of diagnosis and treatment. Physician documentation is necessary to determine the appropriate medical treatment for the patient and is the basis for coding and billing determinations." • Decrease denials and ensure filing deadlines are met. According to an industry survey, Medicare leads payers with the greatest percentage of insurance claims denied (approximately 7%), more than double the denial rate for commercial insurers such as United HealthCare, Humana, and Cigna. Medicare Administrative Contractors perform Targeted Probe and Educate (TPE) audits that focus on specific provider specialties or a unique service performed. According to TPE, the error percentage that qualifies a provider as having a high denial rate varies based on the service or item under review. The Medicare fee-for-service improper payment rate for a specific service or other data may be used in this determination and the percentage may vary by Medicare contractor. In addition to these numerous job functions, dedicated medical coders can monitor managed care and other contractual reimbursement, review Medicare regulatory changes, ensure Advanced Beneficiary Notices are used correctly when the patient has financial liability, perform in-service educational sessions, and conduct ongoing compliance monitoring. Computer-assisted coding (CAC) typically uses natural language processing to produce the appropriate codes for specific phrases and terms within documents. CAC software does not replace the need for extensive coding knowledge—coders must be able to verify the results. CAC is not the same as performing a keyword search in the EHR coding module that produces a list of possible diagnosis codes. In many cases, the default codes received as a result of keyword searches are either unlisted or incorrect. For example, one EHR may default to congenital defect codes while another opts for maternity care codes as the default. The OIG has developed a list of four potential risk areas affecting physician practices: coding and billing, reasonable and necessary services, documentation, and improper inducements, kickbacks, and self-referrals. While there are a number of complaints about the complexity of coding rules and regulations, physicians are still responsible for knowing the guidelines—or employing someone who does. In addition to assigning procedure and diagnosis codes, it is essential that practices establish processes to monitor compliance with payer guidelines. These efforts can also streamline and improve business operations within the practice, and may lead to an opportunity to improve revenue through more accurate code assignment. — Cindy Parman, CPC, CPC-H, RCC, is executive vice president of Coding Strategies.